When a health care network is choosing which treatment center to include in their narrow network or a family member is choosing a treatment center for a loved one, the question that matters most is “does this rehab have a good track record of helping their clients stop using drugs & alcohol and remain clean and sober long-term?” Unfortunately, with the exception of a few of the biggest treatment organizations, few treatment programs have had the ability to generate trustworthy data to address this concern. Vista Research Group’s RECOVERY 20/20 research has been designed to cost-effectively provide hard data certifying the effectiveness of a treatment center’s program in helping alcoholics and drug addicts achieve long-term sobriety, reduce the severity of any co-occurring disorders, and improve their quality of life. 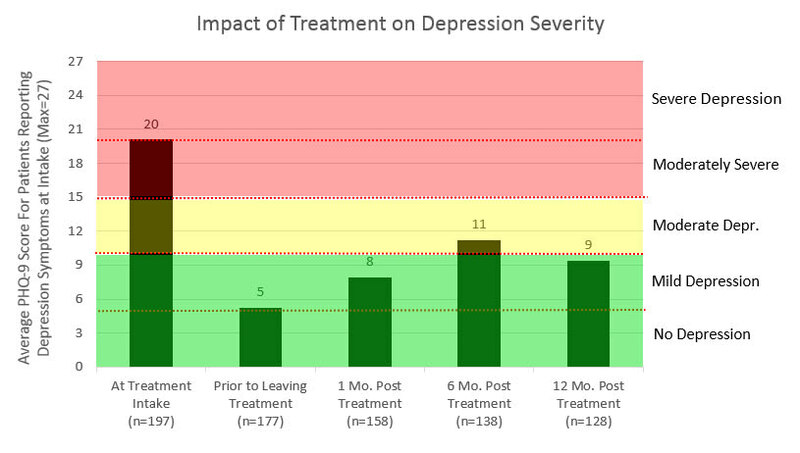 Research Overview: Vista attempts to get pertinent data from clients of the treatment center at four points – early in their stay at the center, one month after leaving treatment, six months after leaving treatment, and one year after leaving treatment. Baseline information is collected from all clients shortly after their admission using the same online intake questionnaire as is used for INSIGHT's progress monitoring research. 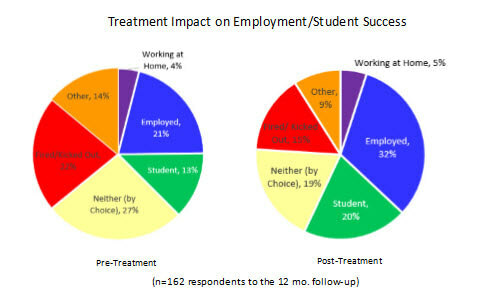 After they leave treatment, Vista makes at least 7 attempts to reach each client at each interview time. If it appears that the client no longer has the same cell phone and/or email, we reach out to the family members and/or friends the client has identified who can help us locate this person. 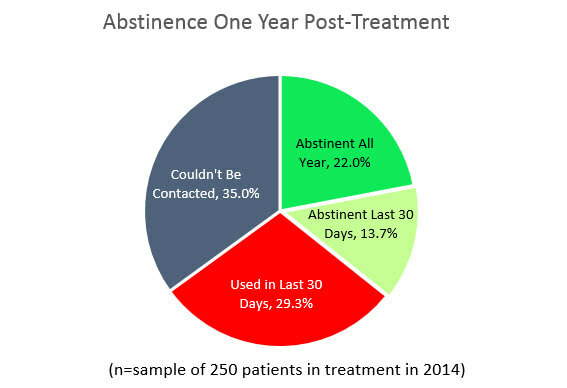 Random Sampling: For treatment centers treating more than 250 clients per year, Vista has the ability to follow a statistical protocol to choose a random sample of 250 clients from among those completing the intake interview. All follow-up interviews are then conducted among members of the random sample only. 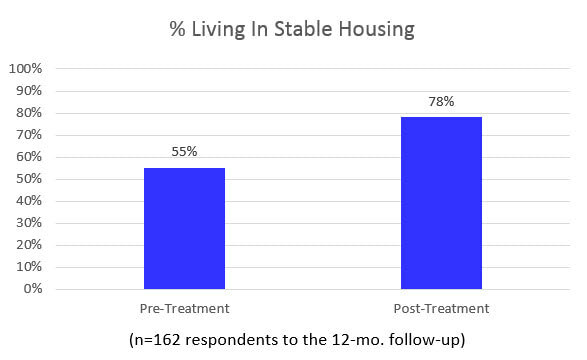 Strategic Analysis: Each year, Vista digs deeply into each center's results to identify possible opportunities for the treatment center to improve their outcomes. The Simplified Strategic Analysis is a sample of the type of analyses that are conducted and summarized in this report. Note: The following charts are for example only; this data is not real! Health Risk Assessment: One of the most crucial factors to payers is how treatment will affect a patient's future health spending. 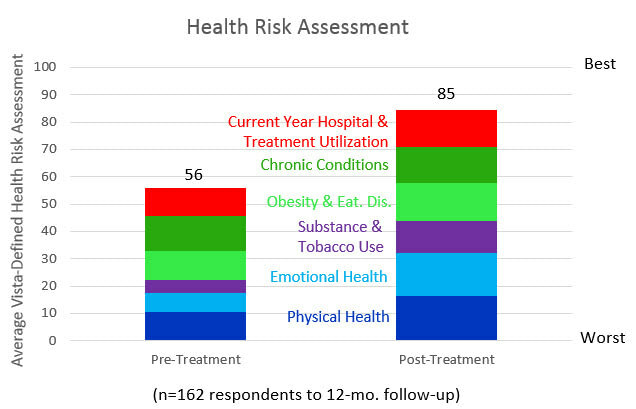 Vista calculates a Health Risk Assessment score before and after treatment to help predict how health care costs will be reduced by treatment. The above types of data for each treatment center are summarized on an annual basis in a comprehensive report suitable for sharing with potential clients and/or payers. 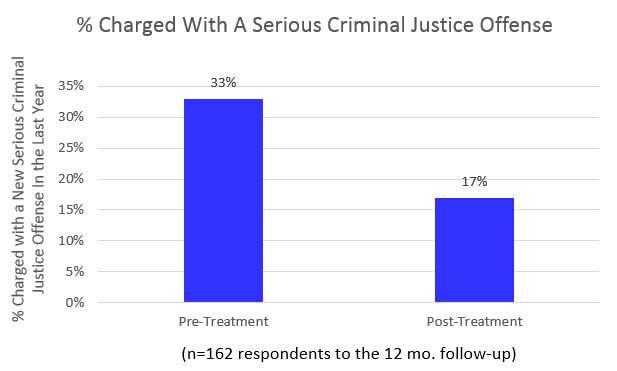 Publishing the treatment center's results is at the sole discretion of the treatment center. For a more comprehensive version of the Treatment Effectiveness report, please email your request. The base cost for RECOVERY 20/20 is $100 per patient. Centers are charged one-third of this amount at one month, one-third at six months and one-third at twelve months after the patient leaves treatment. At each of these times, Vista's researchers will make at least 7 attempts to contact the patient. Because achieving a high response rate is critical to maximizing the center's success rates, Vista incentivizes their researchers to go the extra mile in contacting slow-to-respond patients. If Vista is able to complete at least 60% of the interviews due during any particular month, Vista receives a 10% bonus from the treatment center for that month's calls, with the bonus increasing to 15% for completing 65% of the interviews and 20% for completing 70% of the interviews. For larger treatment centers, Vista will randomly select 250 patients from each group the center wants to be able to report separate results for, thus capping the pre-bonus outcomes research cost at $25,000 per group. For example, if a treatment center wants to report the results of their residential program separately from that of their IOP, Vista will randomly select no more than 250 patients from each of these programs to follow up with after treatment. Yes, I want to learn more about Vista's RECOVERY 20/20 Research! The heck with sending information; let's set up a time to talk!